To save time in the mornings and to cut down on the amount of time my stove is on and because it’s so crazy hot in CA, I decided to soak the oats (I used Coach’s Oats) in Almond Milk overnight. I also soaked some dried figs in water for blending to go with the oats. Come this morning, first thing the girls say to me, like every morning is “I’m hungry. What are we gonna eat?” I was ready for that question. Today we try Raw Oatmeal! Let’s give it a go and see what they think! Please do keep in mind that even though I really try to remember to sort of measure things out, I honestly just eyeball everything. Please adjust to your taste and family size…. 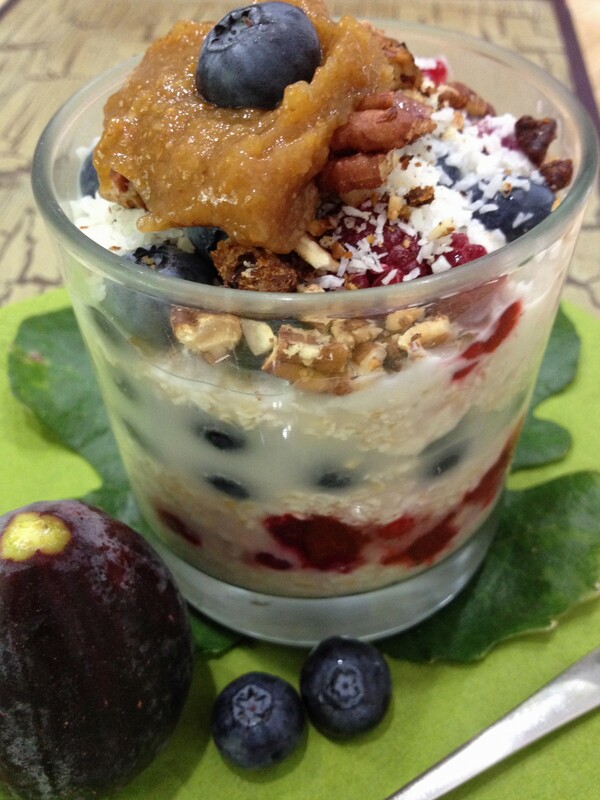 For a visually stimulating breakfast, layer the ingredients into a clear glass or bowl starting with the Oatmeal and finish off with a dollop of fig puree and some Coconut Shreds. if you’re in a hurry, mix all the ingredients together into a beautiful mess and enjoy! * For Gluten-Free Oatmeal, make sure the package says it’s GF! Kids loved it and so did I!